Sharing a meal as a gateway to understanding the other and overcoming differences is a common notion. This paper explores Israeli and Palestinian food-centered performances that complicate this concept (deliberately or inadvertently) by focusing on contested national identity politics. These performances harness food’s intimate relationship to national identity to trigger political debate and awareness and affect change. The wealth of meanings and associations that food products and dishes carry prohibits “innocent” representations, transforming any public representation of nationally identifiable dishes into a space for political debate and interpretation. The paper will also interrogate the difficulties in researching and writing a piece that straddles both sides of a political debate, the question of ownership and the problematic moral stance of appropriating the Other’s food or food-performances. Food and art, nationalism, food and conflict, culinary icons, ownership. Salt of the Earth by Israeli troupe Puppet Cinema uses one thousand pounds of salt to create a bleak, artificial landscape of violence and desolation. This desert-like Middle-Eastern setting created in front of the audience, speaks to the political situation in Israel/Palestine using a simple, everyday food item to paint a picture that is both painful and poetic. Salt is not only a device used for its physical properties to emulate sand, it is used, rather, for its multiple meanings, it becomes another character in the performance, like the faceless puppet that travels its white, shifting expanse. Salt of the Earth is but one example of artists inverting the concept of food as a unifying agent, of the table as a place to gather around in harmony, and of “breaking bread” together as a key to peaceful coexistence. Significantly, according to creator Zvi Sahar, the original concept for the piece was to perform it on a military-like sand table, the kind used to run strategic simulations of battle plans[i]. This paper focuses on Israeli and Palestinian artists who use food as a medium or a central trope in their performance work to complicate and question national identity politics. They take advantage of food’s intimate relationship to national identity and the multiple layers of meaning food products and practices carry, to trigger a debate, an awareness, or a call to action, rather than to stage an optimistic (naïve?) communal interaction between warring sides. The current political situation in the Middle East, with recurring eruptions of violence in the region and particularly the boycott of joint Israeli-Palestinian projects as promoting a “normalization” of the current situation, offers a constant reminder of the complexities inherent in attempting to write about any issue that straddles both sides of the struggle. Although both food and art are often held up as tools for bridging differences and forging peaceful bonds, they are both, in fact, inexorably linked to identity (personal, communal, and national) as well as to politics, economics and religion, thus becoming more effective tools for articulating differences than of erasing them. This is not to say that food and art cannot serve as instruments of peace, though I believe that this occurs not through finding superficial similarities, but in serving as a tool for greater understanding and respect. I took on this project hesitantly since I felt that the story of Palestinian artists’ works was not mine to tell. However, leaving it out and focusing solely on Israeli artists’ work would give a skewed, incomplete picture. In this particularly volatile time, I found it very challenging to reach Palestinian artists for interviews and permission to print their work, so I urge readers to explore further and search these performances out themselves to learn more about them. I persisted in including these projects in this paper since I believe that particularly now, when food is enjoying such wonderful attention and peace-promoting dinners and cookbooks abound on the one hand, while questions of ownership and authenticity are raised on the other, it is important to complicate the way we think of this medium. The projects included here all use food in more complex, nuanced ways that raise more difficult questions. They mostly live in a precarious area between art and life, between the personal and the political, the private and the public, showing that these different realms cannot, in fact, be separated. Puppet Cinema’s company members begin their performance by pouring buckets of salt in the center of the space and then continue throughout the piece to spread the salt and shape it to create and then dismantle a landscape inhabited by small structures, vehicles and figures. The protagonist, a faceless puppet made out of army-fatigue-like material, and the performers, move through the course of the action and the shaped and reshaped salt environment on the way to Ein Harod, the last bastion of resistance in a post-apocalyptic Israel after a military coupe, and toward a glimmer of hope for a different future in reality. The performance combines puppets, live video feed and actors to tell the story of a dystopian future painfully close to the current situation in Israel and was inspired by the novel and life of Israeli author, journalist, artist and activist Amos Keinan. Created by Zvi Sahar, Puppet Cinema, filmed and edited by: Different View Photography. Published with Puppet Cinema’s permission. Salt is universal. It is inextricably linked to commerce and exchange as a valuable commodity, but no single group had embraced it as a marker of identity. Salt is so common, in fact, that no single nation or ethnic group embraces it as a unique icon. In this respect, there is no question of ownership around salt; it “belongs” to the entire human race. It is a unique choice in the context of the Palestinian/Israeli conflict since many other creative projects revolve around contested national food icons such as falafel, hummus, citrus and olives, and explore questions of ownership and national affiliation through the products’ lineage and evolution. Salt, chosen for its physical properties as well as its associated meanings, allows the creators of Salt of the Earth to move away from questions of authenticity and “who was there first,” to a study of the current situation in all its complexity and bleakness. Salt was chosen originally by Sahar as an affordable and accessible alternative to white sand. Like other artwork involving food products an artist’s choice is often guided not by ideology but by the fact these products are simply there. They are readily available, grounded in everyday life and inexpensive compared to some other materials. However, because these products are intimately connected to everyday life they are not neutral, but rather carry layers of meanings grounded in a local reality and specific culture. Once salt was integrated into the performance, its role in it evolved. The question of what does it mean, in different cultures and time, to be “salt of the earth” became a poignant question, as did the protagonist’s journey through a landscape made of a material that is both purifier and corrosive. [ii] In this particular performance, the universality of the product allowed the creators to move away from questions of who has the right to the land, or to a food product, and instead present a complicated reality where there are no straightforward answers. Most of the foods we grow, buy, cook, and eat are everyday performances of affiliation with a greater community (or communities). However, food is not only an instrument of nostalgia and of remembering a homeland, it can be a tool for creating and shaping one, for negotiating old and new affiliations and identities. Food products are a common device for representing national identity and affiliation, like rice in Japan, beef in Argentina, or steak and chips and wine in France (as eloquently articulated by Roland Barthes). These products and dishes are used to perform a national affiliation for members of the community as well as a sign for outsiders (tourists, neighboring nations), a reiteration of national unity in everyday life. It is interesting to note that many of these iconic dishes are products of appropriation and exchange: rice in Japan, for example, was adopted from the Chinese, a former enemy, and embraced as quintessentially Japanese. [iii] A variety of products traveled from one continent and culture to another and have been embraced as markers of national pride. Following the trails of these food products and the reasons and means for their adoption not only as a common part of the menu but as markers of national affiliation, offers a window to a deeper understanding of these nations and cultures. Historically, Jewish nationalism used food to remake the Jewish figure, to aid in the construction of an identity that is as different from the Diasporic Jewish image as it is from the local population of the land. Using it, among other tools, as a way to make the abstract idea of a Jewish nation into a concrete reality. This device was not only used in the fields and markets, but was reflected in artists and designers’ work in posters, paintings and book illustrations from the period. The unique case of Jewish nationalism, physically transplanting a people from a variety of other countries of origin and fusing them to each other and to the land, while simultaneously disconnecting them from 2000 years of existence in the Diaspora, required the development of new, secular, cultural devices establishing a common national bond beyond Jewish religion. Food products and agricultural labor offered effective tools on both the conceptual and the material level. In the case of Palestinian nationalism, we have a somewhat inverted process, a nation that has come into being in the midst of a process of dispersal and separation. Palestinian nationalism has to perform both its steadfast connection to its land of origin and to a common culture, uniting several groups currently living under different governments and conditions. The physical land and Palestinian rootedness are central tropes, encoring Palestinian national discourse. Agriculture work and certain food products like citrus, olives, and prickly pears, became important markers of this essential link. Carol Bardenstein’s insightful exploration of the notion of rootedness in both Israeli and Palestinian imagery, presents the use of trees, oranges and the prickly pear as instruments for demonstrating/forging a close relationship to the physical land. Bardenstein contrasts the early Zionists’ anxiety over their tenuous connection to their new homeland, their lack of rootedness, with the Palestinian sense of uprootedness and loss; Zionist attempts to forge intimate links to the physical land juxtaposed with Palestinian work to represent sumud, a steadfast rootedness in the land. [iv] The centrality of rootedness and the literal connection to the land described by Bardenstein, emphasizes the importance of food products and their production to the performance of national affiliation for both Zionists and Palestinians. Basic food products are common and powerful devices in both Israeli and Palestinian iconography, because of the prominent place of agriculture in both cultures’ past and mythology, and the centrality of the concept of creating/maintaining literal links to the physical land. These products are particularly useful as sites for the performance of the nation in pre-statehood time, offering images of unity and a common culture while a flag, a currency or any other tool of an independent state is not yet available. They speak not only to the very existence of the nation by presenting a single symbol, but also to the story the nation tells of itself – who it is? Where is it located? What does it stand for? Certain food products become as familiar, layered with meanings and associations as any flag, and as such, become powerful symbols that can be appropriated by artists and reshaped. Their appearance in a work of art alludes to a wealth of meanings and enables both direct and ironic messages with a simple, recognizable object. Images of agricultural labor appear in several contexts in both cultures and several products, mostly prickly pear (Tsabar, Sabir), oranges, olives and olive trees, have taken on iconic significance and appear repeatedly in artists’ work as do some dishes like hummus and falafel. They are employed in different way in both cultures to present alternative national narratives. The heated debate about Israeli’s “right” to use falafel as a national emblem reflects, more than anything else, a questioning of Israel’s right to the physical land, to its place in the Middle East. London based, Palestinian artist Larrisa Sansour’s work often revolves around food and kitchen items like falafel, olive trees, or mloukhie. Her video piece Soup Over Bethlehem –Mloukhie (2006), the performance Falafel Road (2010) with Oreet Ashery, Trespass the Salt (2011), Nation Estate (2012) and, most recently, In the Future, They Ate from the Finest Porcelain (2014), all feature different items prominently. Sansour often blends sci-fi themes and everyday objects and materials in her work. She employs popular culture tropes and humor to create art that reflects on questions of Palestinian identity, exile and displacement, and the current conflict with Israel. The surreal images Sansour presents, whether an olive tree growing out of a concrete floor inside a high-rise apartment building[v] or tiny Palestinaut figures[vi], only serve to highlight the surreal and absurd nature of the reality that inspired them. Falafel Road was created during Sansour and Ashery’s London residency in 2010 and was related to a larger collaborative project of the two artists, a graphic novel titled The Novel of Nonel and Vovel (2009). Falafel Road included twenty filmed meals in eateries and markets around London with different guests and passers-by. The conversations around the meals revolved around the question of Israel’s appropriation of falafel from the Palestinians and its adoption as Israel’s own national symbol. Falafel serves in this piece as but one example of a much wider cultural appropriation and eradication of Palestinian culture by Israel. [vii] The project is an art piece framed like a documentary series, the visits tracked on a related blog. The gap between art and life is small and subtle, yet it allows the artists to approach questions of national identity and culture, of ownership and appropriation from a personal, subjective and intimate viewpoint. Sansour’s images are evocative, their humor often serving to highlight the tragic reality that inspired them. The olive tree struggling to grow in an implausible setting evokes a sense of loss and of struggle in the face of adversity. However the blunt questions Falafel Road pauses seem to elicit answers that are more limited in their scope. The artists use the meals to draw attention to a concrete political situation, not to open up a space for conversation. It seems to me that in certain ways Sansour’s tiny Palestinaut figures roaming art gallery halls in their white space suits, seem more effective in generating awareness of the Palestinian displacement and loss than pausing the question: did Israel steal the falafel from the Palestinians? Jumana Abboud, a Jerusalem based Palestinian artist, created a video work that highlights another powerful food item, lemons, in Smuggling Lemons (2006). The piece is completed by a performance in which Abboud made and sold lemonade prepared out of the smuggled lemons to “dispose of the evidence.” In the film, the camera follows Abboud as she collects lemons in a garden in Galilee, places them in a special belt, resembling a rig for carrying grenades, and travels with them through Jerusalem and on to Ramallah where she deposits them on a bare and dusty patch of earth. The lemons are presented as actual characters in Abboud’s film: held so they can “view” the passing, changing scenery on the bus ride to the border, waiting patiently in line to cross the border, passing through the security conveyer belt… The lush, green garden where Abboud collects the lemons and begins her journey stands in stark contrast to the arid land on the other side of the border, where she deposits them. The absurdity of these treeless/rootless fruit speak to Abboud’s view of the absurdity of the Palestinian situation, their longing for the green garden, their rootless current state. Like Sansour’s Olive Tree (2011), part of the Nation Estate project mentioned above,[viii] Abboud’s citrus fruit are an iconic item. Both olive trees and citrus fruit are evocative of a strong, literal connection to the land, and are equated with the Palestinian figure. Their impossible struggle to thrive in concrete/arid earth/rootless state reflects the absurdity of expecting Palestinians to thrive in exile, detached from their own native soil. Conflict Kitchen, a restaurant and on-going public art performance, was established in Pittsburg in 2010[ix]. Serving a periodically changing menu, each one representing another recognized US enemy country, Conflict Kitchen supplements its culinary offerings with relevant events from screenings to cooking lessons, Instagram guest contributors to interviews and pop-up product sales. The Palestinian segment ran from September 30, 2014 to the end of May 2015 (with short closing around November 2014 due to Jewish organizations’ pressure). Conflict Kitchen was not created by a Palestinian artist, yet it employs food to explore questions of Palestinian identity and to offer a different perspective on the current political situation in the Middle East. Palestinian voices (from both Pittsburgh and Palestine) were included in its narrative through the interviews printed on the food wrappers and the addition of a variety of Palestinian guests to the accompanying programming, like allowing Palestinian photographers to appropriate Conflict Kitchen’s Instagram account for their own images. The menu included both more familiar street foods and mezze items like hummus and falafel and less familiar, home cooked dishes like kofta (lamb meatballs) and bamieh (okra). The selection of dishes, the beautifully designed wrappers, and the assorted related programming helped position the food as an important cultural marker, a piece out of a larger picture of Palestinian national identity. 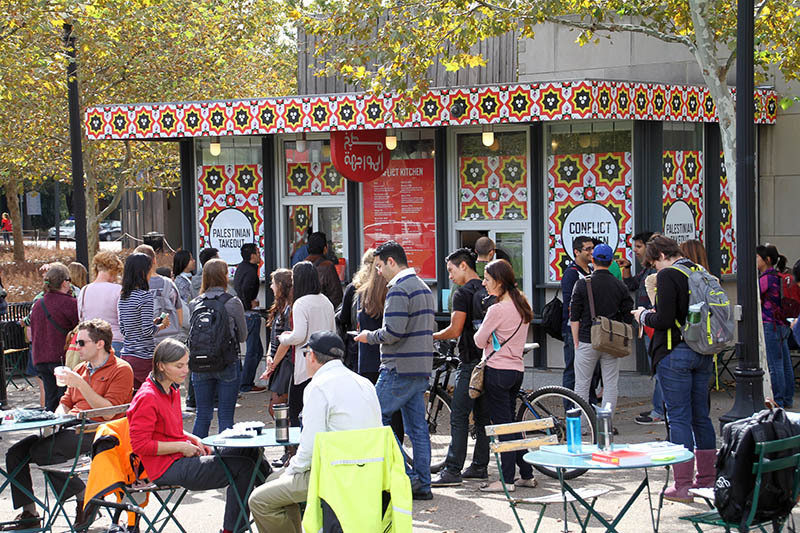 Conflict Kitchen’s Palestinian version, 2014. Published with Conflict Kitchen’s permission. Conflict Kitchen’s Palestinian version food wrappers. Graphic design by Brett Yasko. 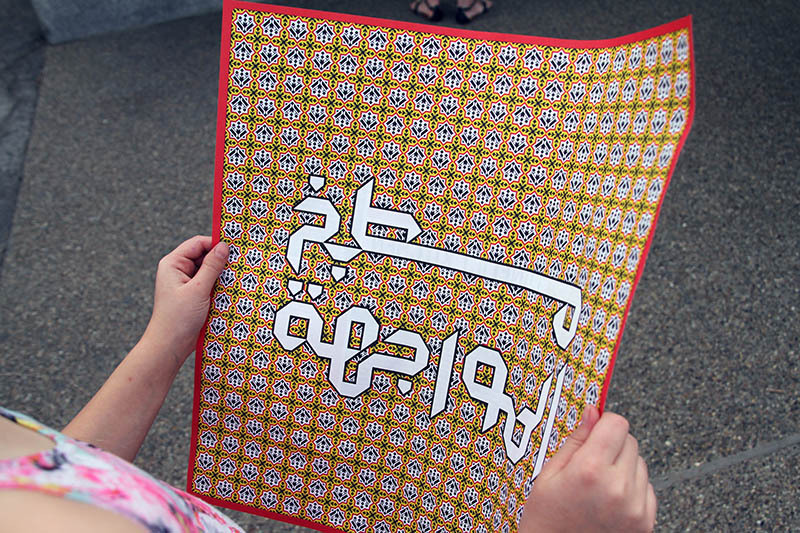 Pattern and Arabic text design by Muiz. The Palestinian iteration of Conflict Kitchen, more than any other previous version such as North Korea or Iran, attracted hostile reactions and critique by those claiming the Israeli side of the conflict was not adequately represented in the related events and literature (particularly interview segments printed on the food wrappers). These objections are illuminating in this context, since they speak to a perception of the table as a place of community and harmony, a gathering space where sharing a meal is a gateway to understanding and peace. Yet, Conflict Kitchen is not interested in gathering all sides around a table, rather, its project is to use the table as a setting for spotlighting one, specific, underrepresented side. Food allows Conflict Kitchen organizers to present the public in the US with an insider view of cultures they would not think to engage with in a political context. They are not attempting to bridge the gap by gathering everyone around the table, but rather use the table to force an engagement with the political issue, to raise questions, to highlight the problem. Several Israeli artists use food as a way to reflect on identity within Israeli culture and society, exploring different ethnic identities within the Jewish national umbrella. More recently, with the influx of non-Jewish immigrants from post Soviet and African countries, the concept of Israel as the Jewish state needed to be reexamined. Until recently the Palestinian population was the only significant non-Jewish segment in Israel, but in recent years this seems to be changing. A recent Israeli project helmed by young artists Yael Ravid and Goore Somer, titled Kitchen Talks (2013), brings together instructors from African migrant communities with Israeli diners in teaching workshops. African refugees and illegal workers comprise the most recent wave of emigration to Israel, and remain suspect and separated from mainstream Israeli society, concentrated mostly in the south of Tel-Aviv. The workshops allow the instructors (from The Ivory Coast, Eritrea, Nigeria and Darfur) a position of power and authority, and create a setting for an intimate meeting and exchange. [x] The meal and the entire event are framed as an art experience, an ongoing, participatory project that aims at affecting social change. What is unique to this project is the approach that positions the outsider (migrant worker in this case) in a position of power and control. They are the ones guiding and directing the local, more established population. Here too the table is not presented as a place for equals to gather around and achieve greater understanding, but rather as an arena for negotiating new roles and attitudes, cultivating respect and not simply a taste for another exotic cuisine. Kitchen Talks presents a new approach to thinking through Israeli national identity and hierarchies. This particular group of non-Jewish immigrants points to the possibility of new ways of thinking about Israeli nationalism and identity in general. Food is intimately connected to representations of identity, both individual and communal. Food products can be directly linked to a physical place, to the land they grow on, but they also travel through commerce, exchange and immigration. Food is intimate and personal, yet also functions in the public sphere through its production, in restaurants and markets, and in public events. It separated “us” from “other” through religious prohibitions and different cooking methods and eating customs. Food can be consumed. It is accepted into the body and becomes part of it. Food is the ultimate medium for exploring the tension between inside and outside, here and away, home and exile. Food products as subjects for artwork facilitate an exploration of these tensions. Using products that are time-based and have a limited life span in art and performance work adds a sense of urgency and relevance to the work. It provides a concrete, tangible link to life. Food as a medium serves as a reminder that these questions are current and vital, and that art can have an impact on everyday life. As such, it is doubly important to remember the complex webs that food products and nations are tangled in and to use the complex narratives food products and dishes can generate to ask the difficult questions, the ones that have no single answer. Like the performances described above, food can be employed in ways that go beyond a superficial gathering around the table that ends when the diners depart. [i] Zvi Sahar, interview with the author, October 10, 2015. [iii] See Emiko Ohnuki-Tierney, Rice as Self: Japanese Identities through Time. Princeton, NJ: Princeton University Press, 1993. [v] Larissa Sansour, Olive Tree, photograph, part of Nation Estate project, 2011. [vi] Larissa Sansour, Palestinauts, hard vinyl sculptures, 2010. [viii] www.larissasansour.com/nation_estate (viewed October, 2014). [ix] Jon Rubin and Dawn Weleski are Conflict Kitchen’s co-directors. [x] Dafna Arad “African Migrants Help Israelis Acquire a Taste for their Neighbors” in Haaretz, June 12, 2013. Ankori, Gannit. Palestinian Art. London: Reaktion Books, 2006. Bardenstein, Carol. “Threads of Memory and Discourses of Rootedness: of Trees, Oranges, and the Prickly-Pear Cactus in Israel/Palestine.” Edebiyat, Vol 8, 1998, pp.1-36. Ben-Zvi, Tal . Sabra: Representations of the Nakba in Palestinian Art Created in Israel. Tel-Aviv: Resling, 2014. Berkowitz, Michael . Zionist Culture and West European Jewry before the First World War. Chapel Hill: University of North Carolina Press, 1996. Boullata, Kamal. Palestinian Art 1850-2005. London, SF and Beirut: SAQI, 2009. Gvion, Liora. Beyond Hummus and Falafel: Social and Political Aspects of Palestinian Food in Israel. Berkeley: University of California Press, 2012. Howell, Sally “Modernizing Mansaf: The Consuming Contexts of Jordan National Dish,” Food and Foodways, Volume 11, Issue 4, October 2003, pp. 215-243. Imperato, Alessandro . “The Dialogics of Chocolate: a Silent DIALOG on Israeli-Palestinian Politics” in J. Celina and G. Minissale eds., Global and Local Art Histories. Cambridge: Cambridge Scholars Publishing, 2007. Pp. 283-304. Makhoul, Bashir and Gordon Hon, The Origins of Palestinian Art. Liverpool: Liverpool University Press, 2013. Raviv,Yael. “Falafel: a National Icon,” Gatronomica, Vol. 3, No. 3 (Summer 2003), pp. 20-25. Salīm, Tamārī. Mountain Against the Sea: essays on Palestinian society and culture. Berkley: University of California Press, 2009. Trubek, Amy B. The Taste of Place: a Cultural Journey into Terroir. Berkley: University of Californian Press, 2008. Zubaida, Sami. “National, Communal, and Global Dimensions in Middle Eastern Food Cultures,” in Culinary Cultures of the Middle East. London and New York: I.B. Tauris, 1994, pp. 39–41.